KA Electronics/Rockmore-Labs introduces the Stereo Insert Switcher designed by Markus Samper aka majestic12. This is the construction and application thread for the Stereo Insert Switcher. 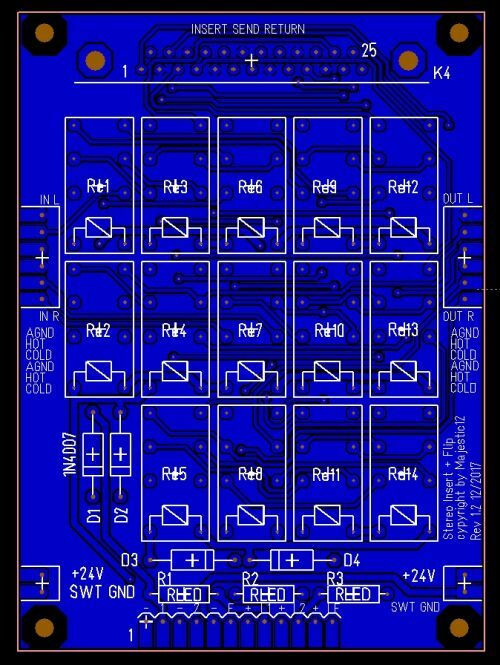 Update 5/29/18: Rev 1.2 boards are now being shipped which have an updated silkscreen to reverse power supply and diode polarity to permit Panasonic relays to be used. Follow the silkscreen when connecting the board. Updated schematics will be posted soon. • Backbone signal flows through the connections on the left to the right. 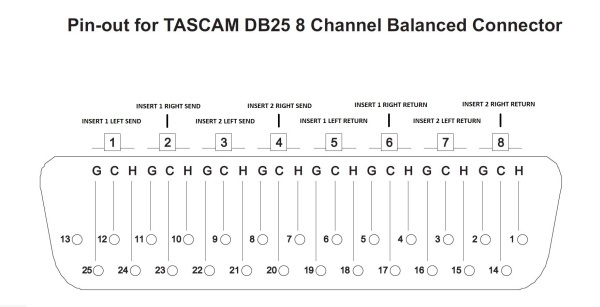 Insert connections are on the 25 pin D in a modified Tascam format. • Normal signal flow is Left/Right Backbone In > Insert 1 > Insert 2 > Backbone Left/Right Out. • When Flip is engaged signal flow is Left/Right Backbone In > Insert 2 > Insert 1 > Backbone Left/Right Out. • Cascadable using aditional boards in series for more inserts . • Isolated audio and relay grounds. 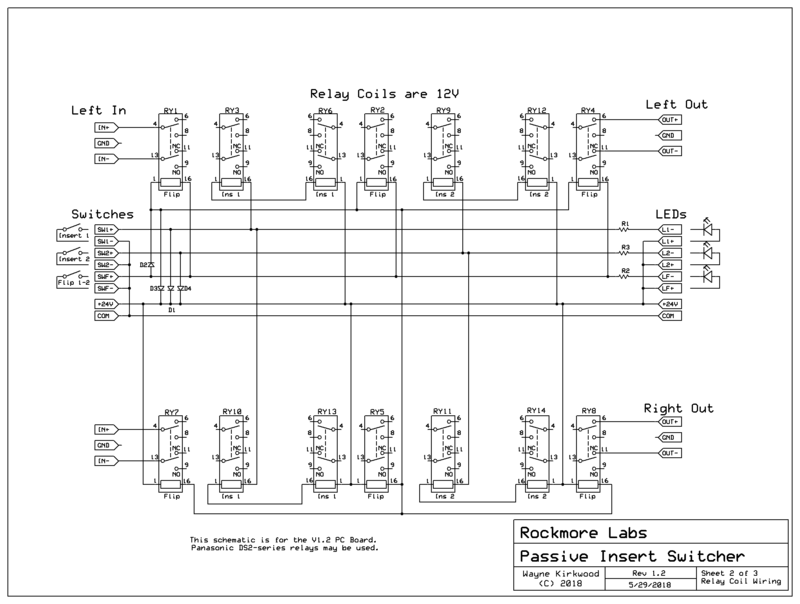 The insert switcher can be built as a two insert switcher with flip, an insert switcher without flip a single insert/bypass or two independent insert/bypass.. The bill-of-materials is for a two insert with flip. The Mouser BOM cannot be edited. To edit, load it into the shopping cart. Remove the number of relays as needed. A fully-configured switcher uses 14 relays. 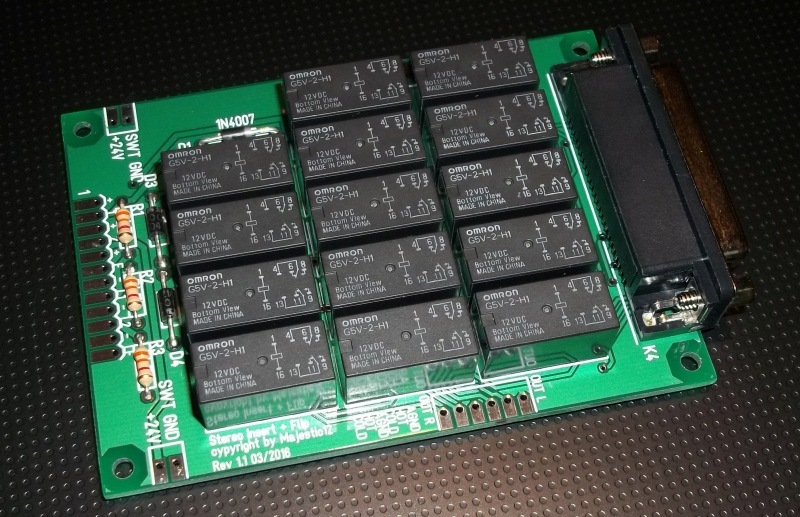 Without flip 8 relays are required. 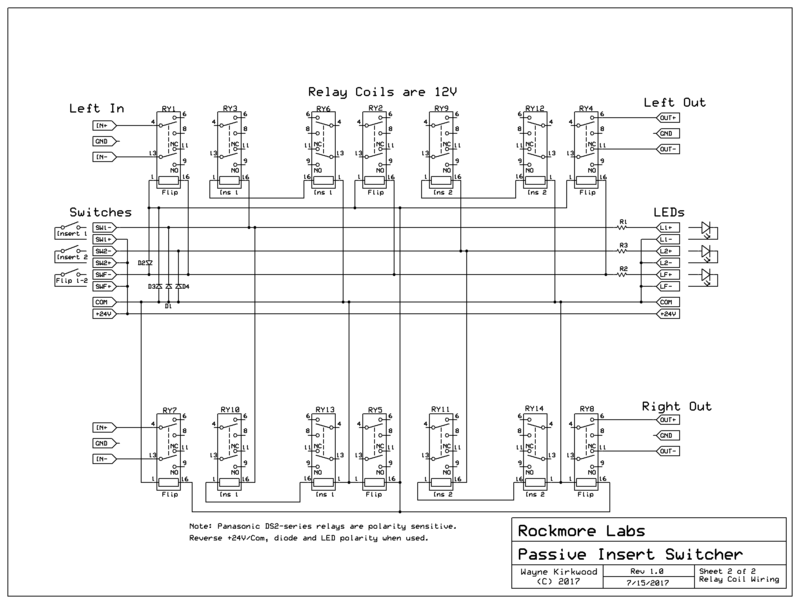 A single insert uses only 4 relays. For XLR I/O or hardwired applications do not install the 25 pin D connector and wire directly to the board. Stereo Mastering Insert Switcher PC Board, Fully Balanced, Passive, Two Insert with Flip. The relay coil requirements are 12V. The control supply is 24V: A series/parallel connection is used to reduce current. The Mouser BOM specifies Omron G5V-2-H1-DC12 "H1" high-sensitivity relays. With all relays engaged the 24V supply current is about 135 mA. Panasonic DS2Y relays are polarity sensitive. Do not use Panasonic relays unless you intend to reverse the control supply, diode and LED polarity. Omron, Fujitsu, Takamisawa etc. do not have a coil polarity requirement. 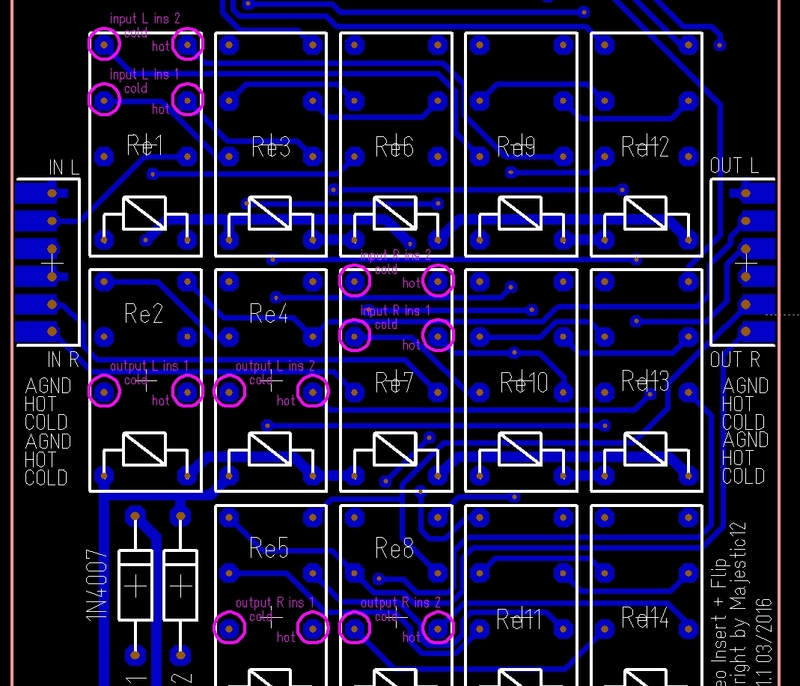 On V1.2 boards Panasonic DS2Y relays may be used. Stereo Mastering Insert Switcher PC Board Stuffing Diagram. The insert switcher uses a female DB-25. Planet Waves provides breakout cables which are also DB-25F. To use the breakout cables male-to-male snakes are available in various lengths from 5-25 feet. To eliminate the Flip function do not install six relays. The normally-closed contacts of the flip relays are jumpered (shown in pink). The relays that are used are RE3, 6, 9, 10, 12, 13. The relays that are not used are RE1, 2, 4, 5, 7, 8. Stereo Mastering Insert Switcher PC Board Stuffing Diagram without Flip. The normally-closed contacts of the Insert 2 and flip relays are jumpered. Install relays at RE3, 6, 10, 13. The relays that are not used are RE1, 2, 4, 5, 7, 8, 9, 11, 12, 14. Split Backbone. Two Independent Full Bypass. I/O points are at the flip relays. 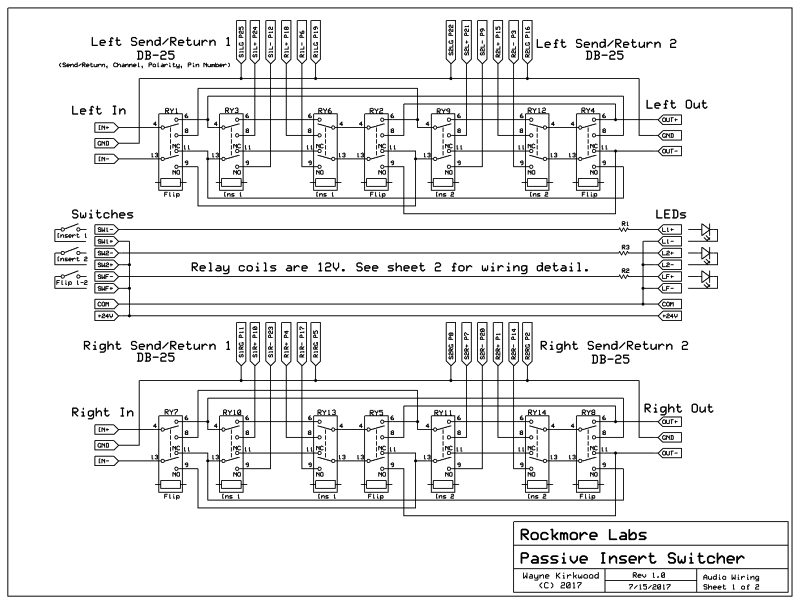 Stereo Mastering Insert Switcher PC Board Stuffing Diagram for Split Backbone. Useful for Two Independent Full bypass. 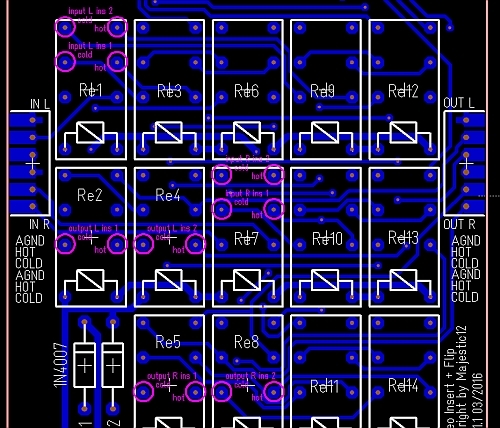 This is the Insert Switcher V1.2 silkscreen showing polarity reversal of the +24, SWT Gnd and diodes to allow the use of Panasonic relays.